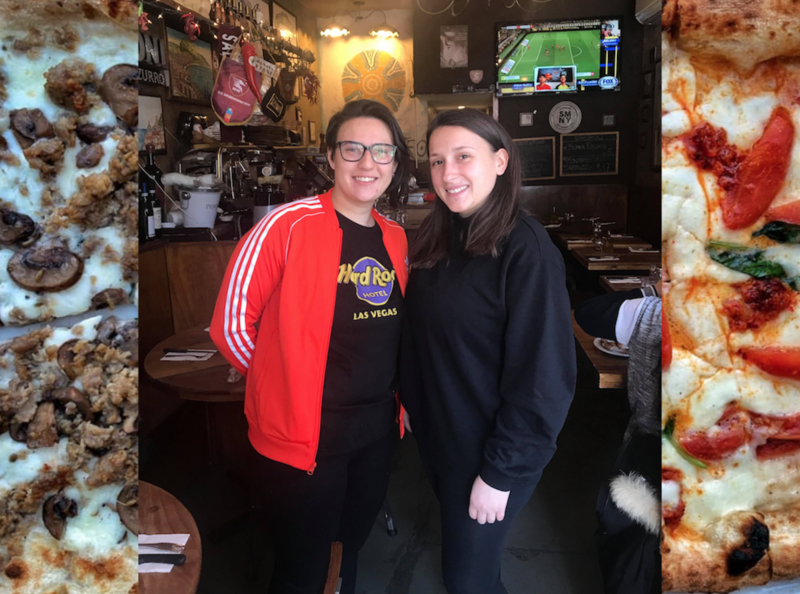 In 2010, Ciro and Fabio Casella moved to New York from Salerno and opened San Matteo Pizza Espresso Bar, a homey and authentic pizzeria serving Neapolitan-style pizza, panuozzi and other specialties from the Salerno region. 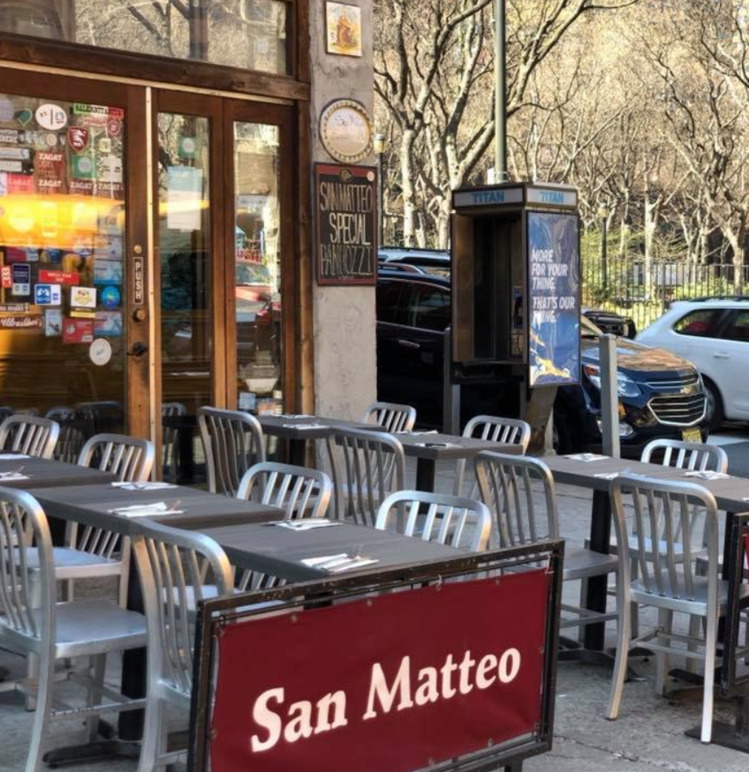 They then opened a second larger location in 2016, San Matteo Pizza e Cucina, just a few blocks down. 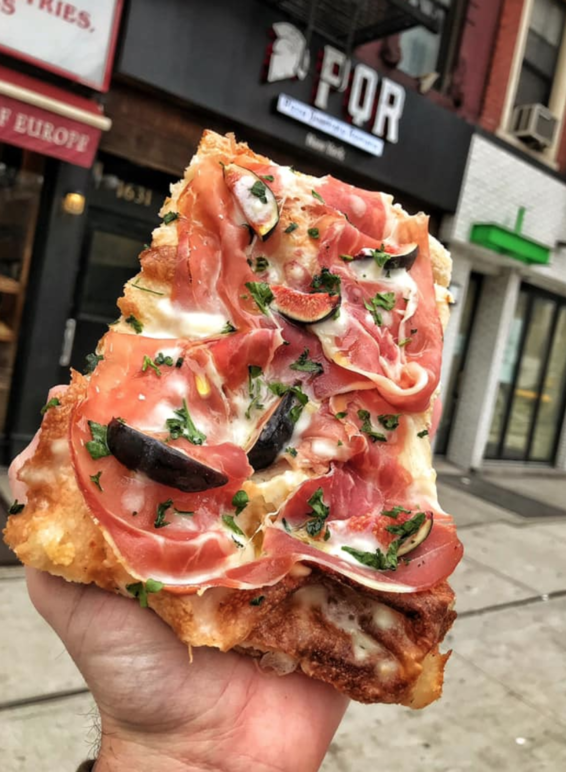 The latest addition to their NYC venues introduces a concept that is extremely diffused in Italy but virtually unknown in the US: Roman pizza “al taglio” or “in teglia”. They named it PQR, which stands for Pizza Quadrata Romana (literally “roman square pizza”) because this format is originally from Rome, though the pizza they serve follows a unique recipe invented by Roman pizzaiolo and president of API (Associazione Pizzerie Italiane) Angelo Iezzi, who devised a new method of making dough for a lighter, easier to digest pizza that is lower in carbs and remains fresh longer. 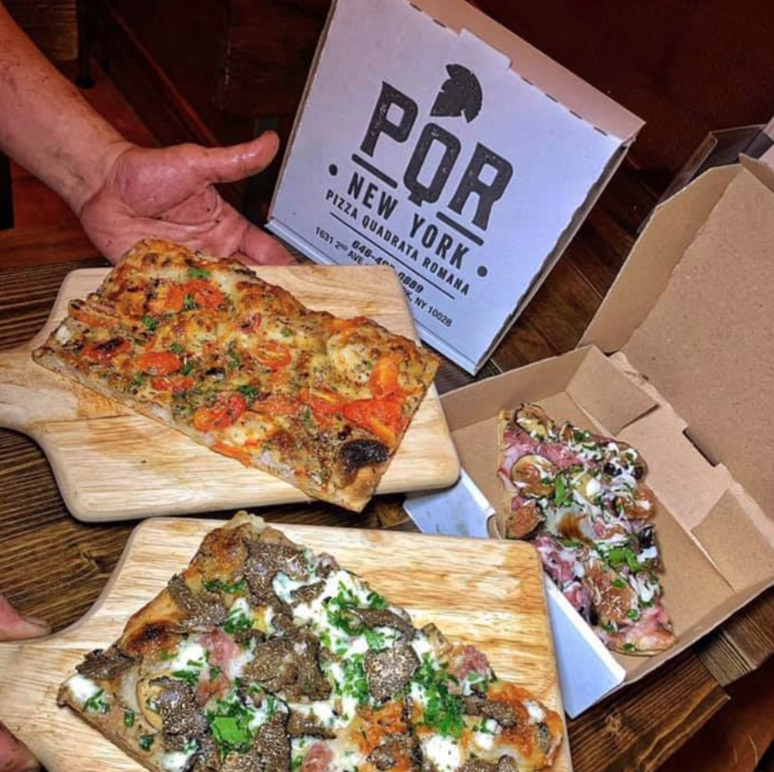 Located on 2nd Avenue in Manhattan’s Upper East Side, as are all the venues owned by the two brothers, PQR looks and feels exactly like any pizza “forno” (oven) you would find in Rome: the front room is quite small, with just three seats and a tray holder, the pizzas are baked in rectangular iron pans and placed on the counter as they come out of the oven. 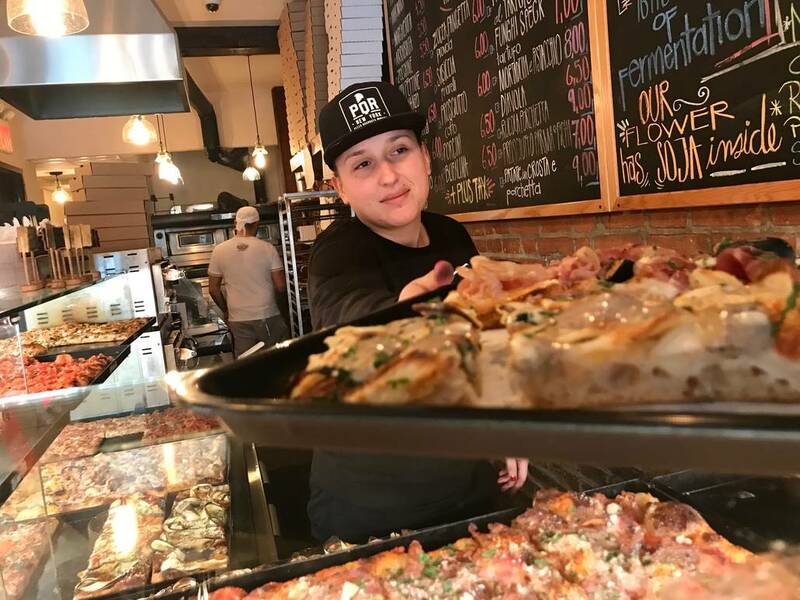 Ciro’s 28-year-old daughter, Marika Casella, welcomes us in from behind the glass as she cuts two generously-sized square slices and hands them to us: one serving of prosciutto and fig and one of truffle and potato. We eat them as Radio Italia plays songs by Vasco Rossi and Gianna Nannini before moving to the slightly larger back room. Marika Casella: I really didn’t imagine I would end up here. I wanted to stay in Salerno with my friends. Then, as I started to get older, and with my father being here, I finally decided to come. I-I: Had you worked in a pizzeria before? MC: No, never. I had done several jobs but never in the restaurant business. It was all new, everything changed. I-I: What was your first impression? MC: The rhythm is frenetic. I was used to working on a schedule. Italians are creatures of habit, they’re more regular, they do things at certain times. Here, people come in at all times. Every day is different, you never know what it’s going to be like. I-I: What’s it like working with your father? MC: It’s good. Sure, sometimes we see each other all day (laughs) but ultimately we get along well. I-I: How do you find yourself here? Do you think you want to stay here? MC: Lately, I started thinking that I do want to stay here. But that’s very recent. The first years I always thought about going back home. I often go back. Home always calls. Last year, I spent the year back in Italy. And after that, I came back and now I see New York differently. Now I think I want to stay for a while, I feel more stable here. I-I: What do you think is the key to the success of your father’s businesses? 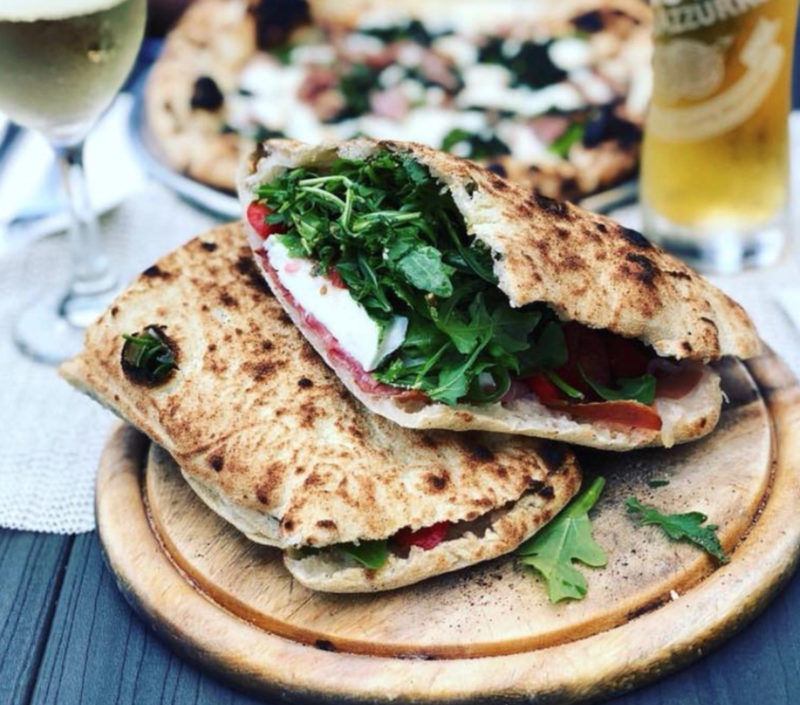 It’s a simple concept, pizza al taglio, it’s something that exists everywhere in Italy. Americans are already familiar with it, it’s very much like grabbing a slice. It’s already in their culture. But it’s a different type of pizza, more sophisticated, with different ingredients, many toppings, richer, and more expensive. It’s interesting, people here are intrigued by it. And when they try it, they like it. The dough is made in a unique way, by a Roman pizzaiolo, Angelo Iezzi, it's very light and it goes well with all sorts of toppings. 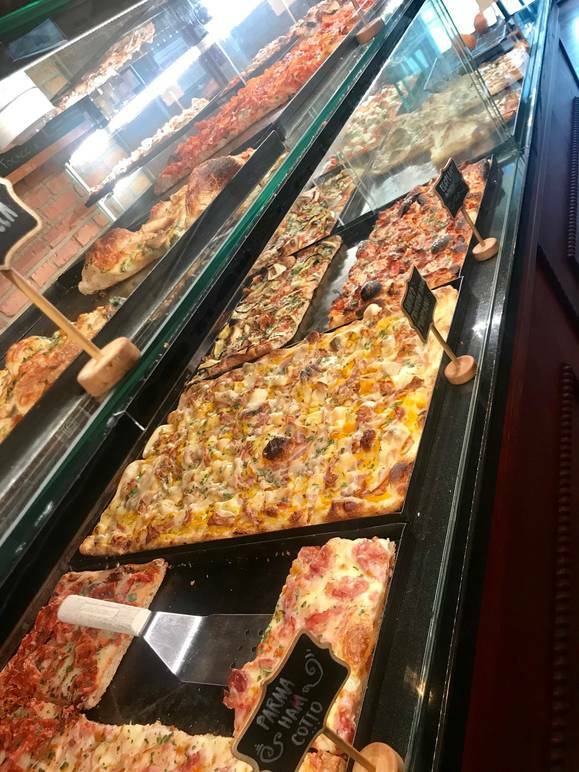 I try a few slices every day. Somehow there’s nothing else quite like it here and it’s really catching on. I-I: What are some of the most popular flavors here? MC: Pizza "alla diavola", with spicy salami. The ones with bufala. The truffle pizza as well, and the burrata. Also some of the specials like the prosciutto and fig you had. People come in at all times, for lunch, maybe a little less in the afternoon, and then for dinner, but quite early during the week. We do a lot of deliveries, they’re great for groups because you can try out many different toppings, it’s easier than with round pizzas. I-I: What did you miss about America when you were back to Italy last year? MC: I actually missed the rhythm, the work. At first, when you’re back in Italy, everything is beautiful, relaxing but then eventually you do miss the rhythm, the frenzy. I-I: Once you get into this rhythm then you have to come back. MC: And you know what? You get right back into it. I was in Italy for a year and after two days here, I was already back in the system. It’s strange to think about because I always thought that the frenetic New York lifestyle really wasn’t for me. I’m a creature of habit, back in Italy I always go to the same bar, see the same people. When I came here, all my plans changed. But you get used to it. Like I said, I came here initially to join my dad but then I became passionate about this job myself. I didn’t expect it. I-I: Are you a soccer fan? MC: Yes. I’m a “tifosa” of the Salernitana. It’s not a major team though so I can’t see the games here. 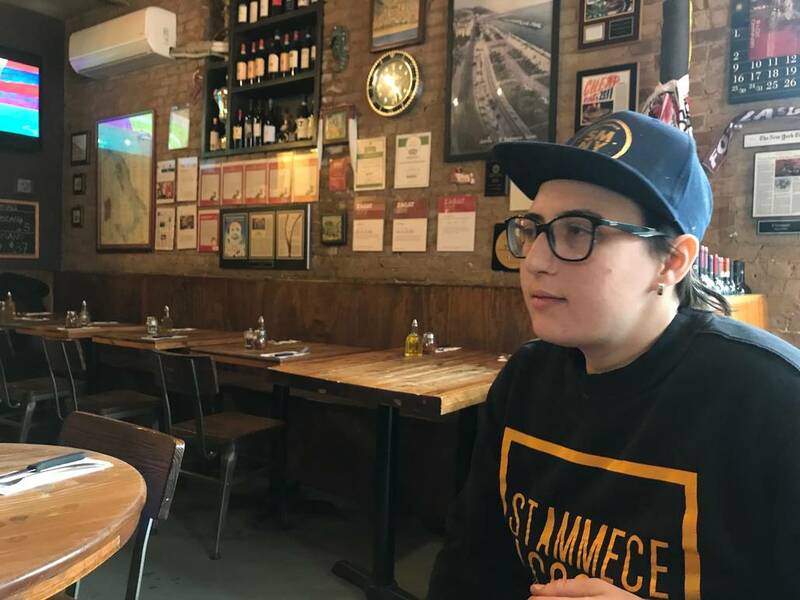 I-I: Maybe you could screen them here, there are a lot of people from Salerno in New York. MC: Maybe, we still have to get the TV though. And the rights. Letting Marika get back to her customers, we leave PQR and walk a few blocks over to San Matteo Pizza Espresso Bar, a cozy and welcoming pizzeria with walls covered in all sorts of adornments, from “vedute” of the gulf of Naples, to pictures of Totò, red Salernitana scarves, reviews, certificates, lucky horns, and a vintage neon Peroni sign. You can see the small but beautiful mosaicked wood oven in the back, depicting a yellow sun against a light blue background. 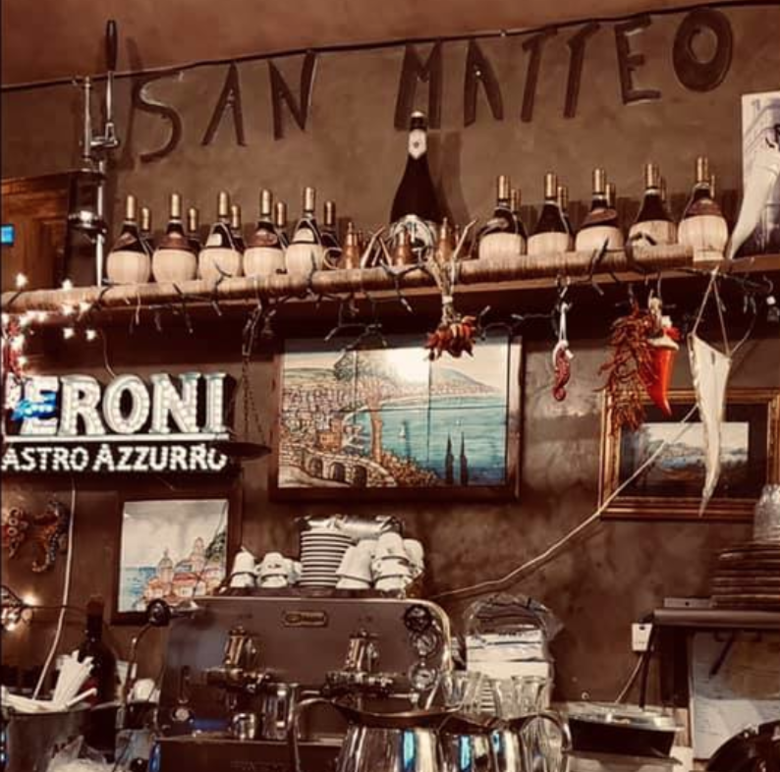 In front of it are a tiny wooden counter and, amidst the numerous wine bottles, a shiny espresso maker that looks exactly like the ones you would find in any old Italian bar. 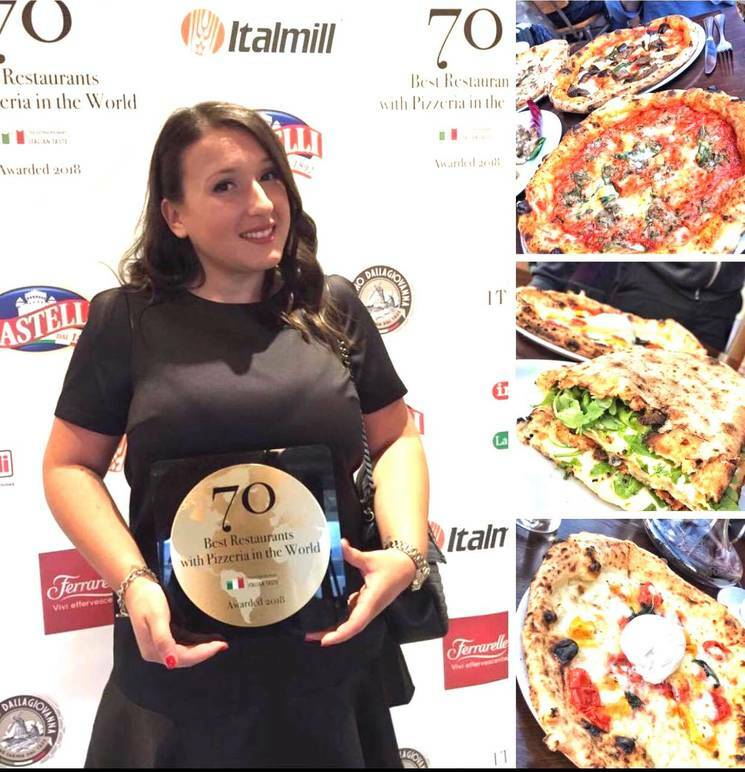 Imma Liguri: I started working in Naples, it was hard as a woman there because the figure of the pizzaiolo is strictly male. There’s a very hectic rhythm to it, lots of arm movements, weights to lift...but I’m very stubborn. I come from a family of pizzaioli. I’ve always been interested in both pizza and cuisine. I focused on pizza because, with just two ingredients, water and flour, you can create a base for everything, even cuisine. I-I: And how did you get here? IL: I was working in pizzerias in Naples and surrounding towns and then I lost my mother 6 years ago. I had never left Naples but I came here, stayed with him and his family at first. Lovely people, they treated me like their daughter. It took me a while to get used to the city, to the rhythm. I-I: But you don’t spend all your time here, you take part in competitions too. 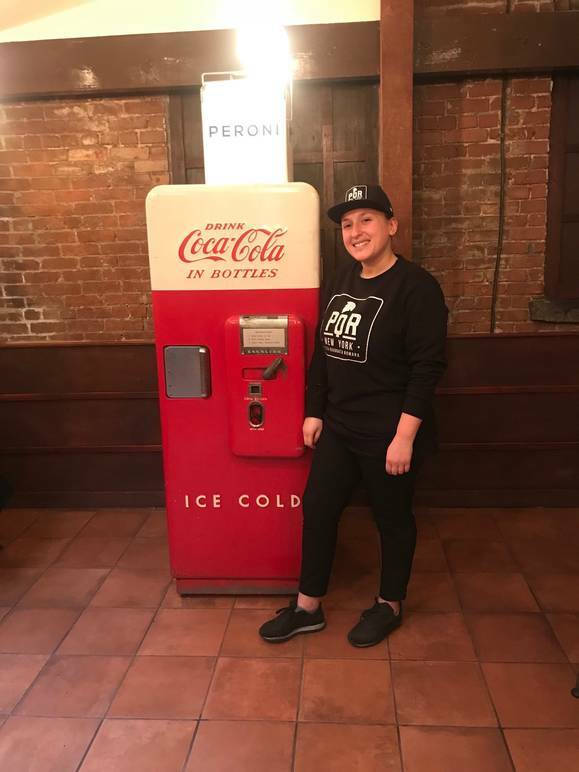 I-I: In the last couple of years Neapolitan pizza has become very popular here in New York, but when you first got here, it was only starting to gain recognition. How did you “explain” it to Americans? IL: I had some trouble making Americans get that the pizza we make is cooked, not raw. Because for them if the dough sinks in it means it’s raw, but it’s not, it’s how Neapolitan pizza is. It’s a type of pizza that has to be eaten at the table, you can’t eat it with your hands. I did adapt a bit. Here, I try to make a pizza that’s easy to digest, that’s well cooked but not too much like American pizza. I use semolina on the table, to make it a little crispier. 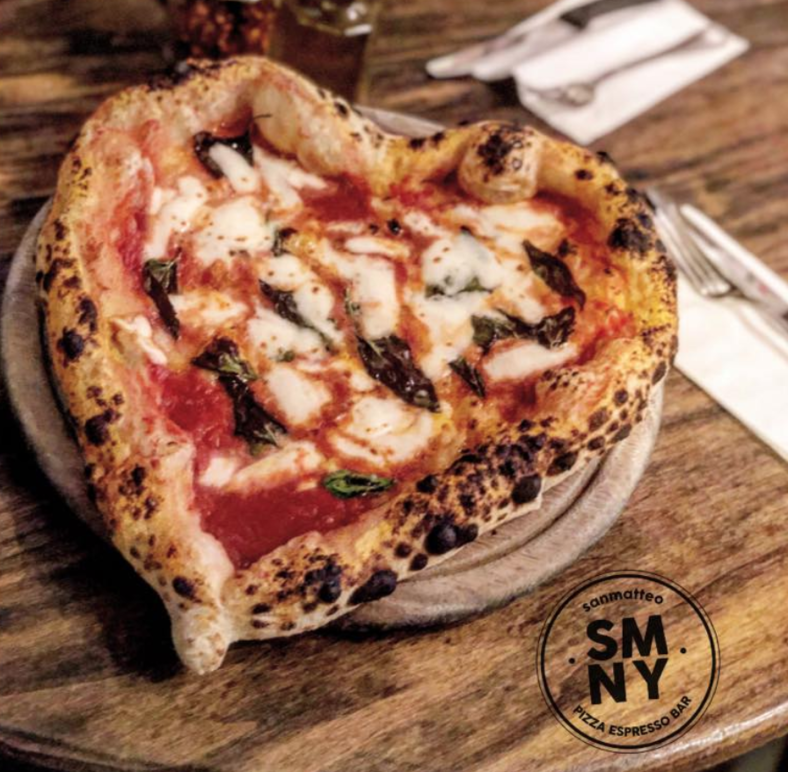 I-I: What makes Neapolitan pizza different? IL: It’s the hand of the pizzaiolo. It’s the person who makes the pizza that makes the difference. Or else we’d all be making the same pizza. I-I: You don’t have to be from Naples to know how to make though? IL: Of course not, Fausto here is the only person who makes the same pizza as me, I taught him. He can make it exactly the same, and he’s Mexican. Every time you put your hands on the dough, you have to understand if in that moment it’s hard, soft, if too much water could come out. You have to feel it, like when you touch a man and you can tell if he doesn’t take care of himself, if he’s delicate. They often come in to pay compliments, to ask for information about the oven, the flour I use. The greatest thing is when clients ask for me. When I leave to go on vacation, clients message me on facebook, asking where I am. I think it’s important to show that there still are people out there, especially young people, who want to do things well, with passion. I-I: So you like being here. 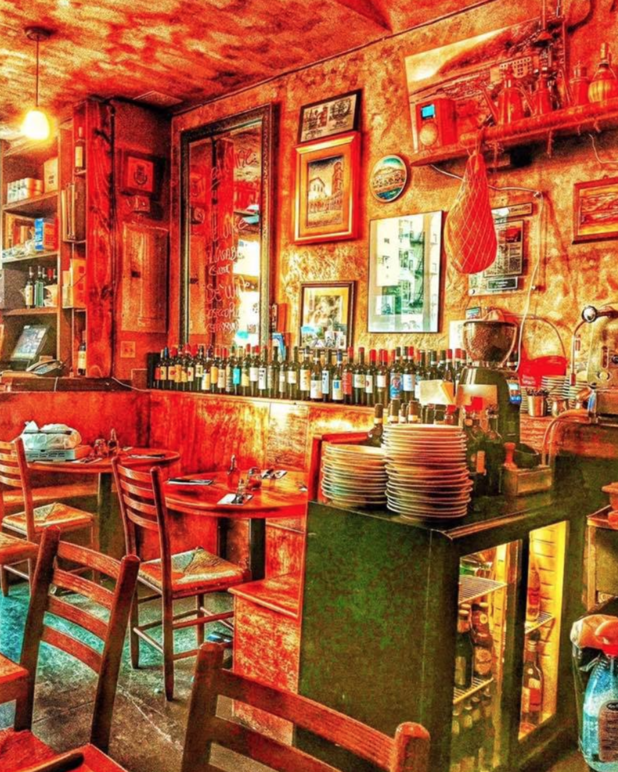 IL: When I first got here, the restaurant was small, the pizzaiolo was from Salerno and I felt quite at home. And I loved how nobody looks at you here! Women can do any job, drive a truck, a bus. Nobody questions it. In Italy, more in the South, women are still supposed to clean, cook for their husband, take care of the children. I-I: Do you think you’ll go back to Italy? IL: I want to go back home eventually, I love home. I’m like that. I was afraid to come here. But the night before leaving, I dreamt my mother saying she wanted to see New York, and, since I’m a bit superstitious, I did it. I came here and it’s been a good experience. I understood that Italians do so much abroad that they don’t do in their own city. I-I: Why do you think that is? IL: I think that Italians want to exalt Italy abroad but don’t value themselves at home.